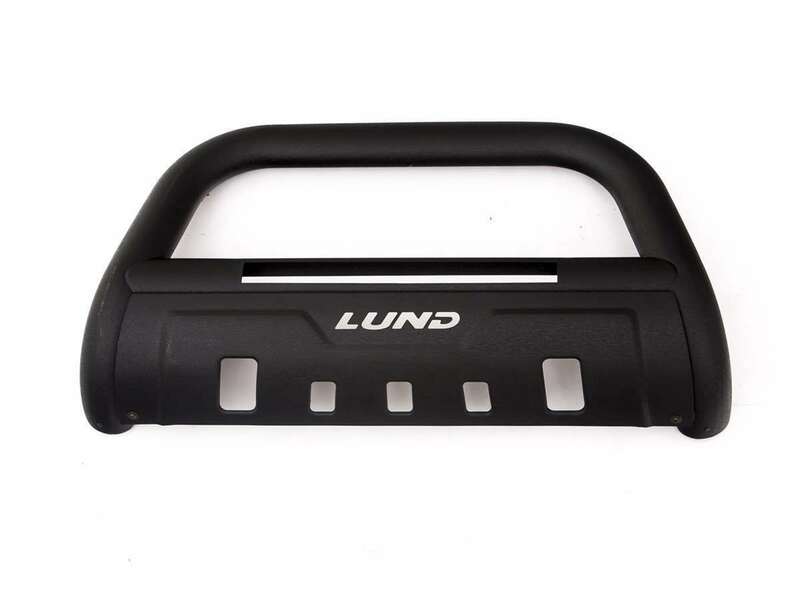 Protects your front end from flying debris with 3.5 inches of oval steel tubing. 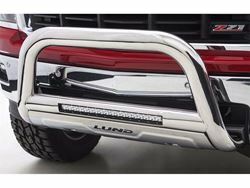 These bull bars also boost your visibility with an integrated 20 inch LED light bar. The included heavy duty light bar illuminates your night driving with a bright flood beam pattern and is easily wired into your factory light wiring, or a wiring harness can be purchased separately. Available in black textured powder coat or polished T304 stainless steel finish. Our popular LUND bull bars may now be ordered with a wire harness kit. The wire harness kit is also sold separately for lighting and accessories up to 30 Amps. LUND’s bull bars with LED light bar and wiring kit is the total package to “see and be seen”, providing complete front end -- style, lighting and protection.